Increased automaticity, which lessens the burden on working memory. This means that you don’t have to actively concentrate on the act of writing itself, and that you can instead focus on thinking about what to write. Increased overlap between the mental generation of output and the consequent production of text relating to that output. This means that you can write your thoughts down immediately as you are forming them, without suffering from a delay which hinders your thought process. Improved performance in various academic tasks, and especially those that require a lot of handwriting, such as note-taking during lectures and in-class essays. Below is a collection of tips and strategies, which can help you learn how to write faster by hand. Some of these can be implemented immediately with no effort, while others require a bit of practice. You don’t have to do everything that’s listed here; it’s fine to pick out even just one or two things that you want to focus on while writing. Doing this will require only a minimal amount of effort on your part, and will still allow you to gain a significant improvement in your writing speed over a short period of time. Improving your handwriting technique is a good way to improve your writing speed. Good handwriting technique involves using your fingers as guides, and moving the pen using your forearm and shoulder muscles. This allows you to write quickly, without tiring out or getting cramps. Bad handwriting technique involves drawing the letters using your fingers, moving your wrist constantly, and repeatedly picking up your hand from the paper in order to move it across as you write. These issues slow down your writing, and cause your hand to tire out and cramp. How to get your technique right: in order to get a sense of which muscles you should use, try holding your arm in front of you, while writing large letters in the air. Use the guidelines above in order to see which technical practices you should follow, and which you should avoid. Once you get used to these movements, try to implement them as you write on paper, while making sure to keep the technical guidelines in mind, and to check up on your technique from time to time as you write. Maintaining good posture is an easy way to improve your writing speed, while also helping you stay healthy and feel more comfortable while you write. To help improve your posture, you ideally want to be seated with your feet resting flat on the floor, and with your hips and lower back supported by the chair. At the same time, your knees should be flexed to approximately 90˚, and your elbows should be slightly flexed, with your forearms resting comfortably on the desk surface. You should avoid slouching over the paper while you write, since doing this puts unnecessary strain on your arm, which makes it more difficult to write. In addition, make sure to set the height of the desk and the chair properly, in a way that encourages proper posture, based on the guidelines that we saw above. When the desk/chair combination is set with improper heights, you will find that it’s more difficult to maintain good posture, which hinders your writing. Research shows that your grasp (i.e. the way you hold the pen in your hand) doesn’t have much of an impact on your writing speed. Furthermore, note that when writing for extended periods of time, it’s natural to sometimes vary the way you hold the pen, so this is not necessarily indicative of a problem. Therefore, as long as you feel comfortable while writing, you can hold the pen or pencil whichever way feels comfortable for you. However, if the way that you naturally hold the writing utensil feels uncomfortable or causes you to cramp, and you decide that you want to improve it, it’s generally advisable to go with the commonly used dynamic tripod grip, which is shown in the image below below. The pen should be pinched between the thumb and index finger, slightly above the area where the sharp end of the pen meets the shaft. There should be an open space between the thumb and index finger. The pen should be resting against the middle finger. The ring finger and little finger should be tucked into the palm. People tend to grip their writing utensil too hard, especially when trying to write quickly. The problem is that doing this slows you down, and causes your hand to tire. The best way to avoid this is to consciously check up on yourself while you write, and make sure that you’re not gripping the pen too hard. It’s okay to hold it firmly, but you don’t want to be actively crushing it with your hands. If you consistently correct yourself over time and avoid gripping too hard, then eventually you should be able to maintain the appropriate grip strength naturally. Note that if you find yourself constantly gripping your pen too hard, it’s possible that you need to get a new one, that better fits your hand. You’ll read more about this in the next section. Thickness– pick a pen that isn’t so thin that you end up having to squeeze it tightly, or so thick that it ends up being uncomfortable to hold. If necessary, you can increase the thickness of a pen by putting a small rubber grip on it. The right size for a pen depends on how big your hand is and on your personal preferences, so experiment and find out what works for you. Tip size– pick a pen that has a tip size that you feel comfortable with (e.g. 0.5mm versus 0.9mm). Which one works better for you will again depend on your needs and preferences, so you should experiment and find out what works for you. Quality- use a good quality pen, that doesn’t require you to press hard on the paper in order to get the ink out. This alone can make a huge difference, and a good pen doesn’t cost more than a few dollars, so there’s no reason why you shouldn’t just buy one. You can increase your handwriting speed by making a few simple modifications to your handwriting style, and specifically by simplifying the way you write the letters. This means that you should try to get rid of excessive marks and styling, as long as omitting them has no impact on the legibility of your writing. It’s also possible to modify the size of your letters, and in theory, if you decrease the size of your letters, you will need to move your arm less when you write, which should enable you to write faster. However, this is not necessarily true in practice, and reducing the letter size might end up slowing you down, by making it more difficult for you to write the individual letters. Since this is also something that varies from person to person, you can experiment and see what works for you. Shorthand writing systems use various unique symbols, which can replace letters, common letter combinations, sounds, or frequently-used words, in order to save time as you write. You can either learn an existing shorthand system, or develop your own. Commonly used shorthand variants include Gregg, Pitman, and Teeline. One of the ways to benefit from the use of shorthand without having to put a lot of effort into learning a full shorthand writing system, is to focus only on a small number of words which appear frequently in the language, such as ‘the’ and ‘to’. It’s relatively easy to simplify these words, and doing so can lead to a significant improvement in your writing speed, while still keeping your writing fairly legible. Finally, keep in mind that the more you rely on shorthand, the more difficult it will be for others to decipher your notes. This can be either an advantage or a disadvantage, depending on your preferences. Improving your handwriting speed can have significant benefits, such as increased automaticity, increased overlap between mental generation of output and the consequent production of text, and improved performance in academic tasks. There are a lot of things you can do in order to improve your handwriting speed, and you can pick which aspects you want to work on, as each of them will lead to notable benefits by itself. 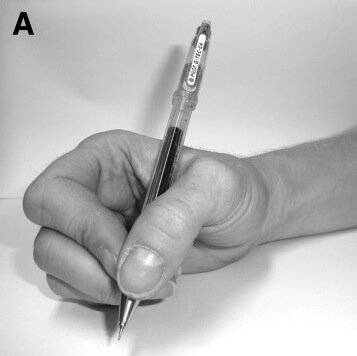 In terms of writing technique, make sure to use your fingers as guides, and move the pen using the forearm and shoulder muscles, while maintaining a good posture. Avoid drawing the letters with your fingers, moving your wrist constantly, repeatedly picking your hand up from the paper, gripping the pen too hard, or slouching over the paper. 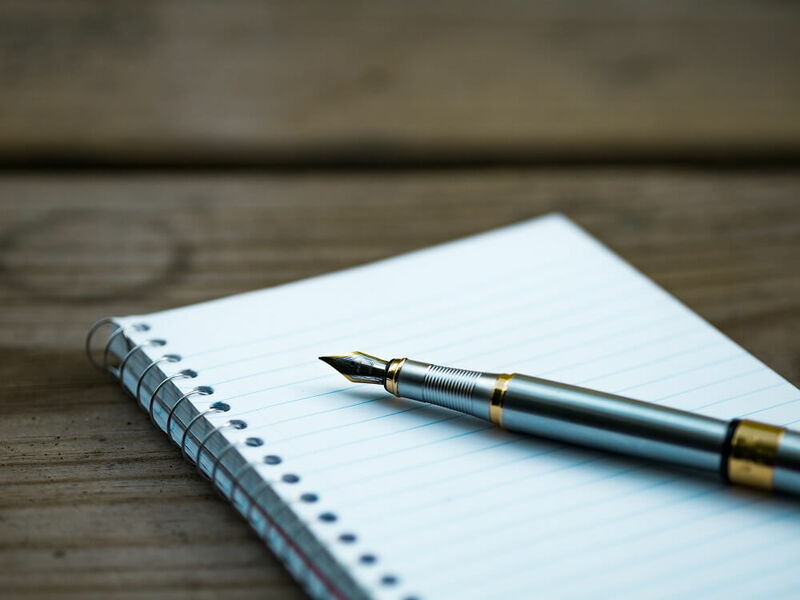 Make sure to get a good writing implement that is convenient for you to write with, in terms of not being too thin or too thick, and in terms of having a comfortable tip size. Furthermore, make sure that the pen is of high-quality, and that you don’t have to press too hard on the paper in order to write with it. Finally, in order to increase your handwriting speed, you can also choose to simplify the way you write the letters, or use a shorthand writing system. The greatest benefits of using such systems comes from simplifying frequently used words (such as ‘the’), which saves you a lot of time while requiring relatively little effort.